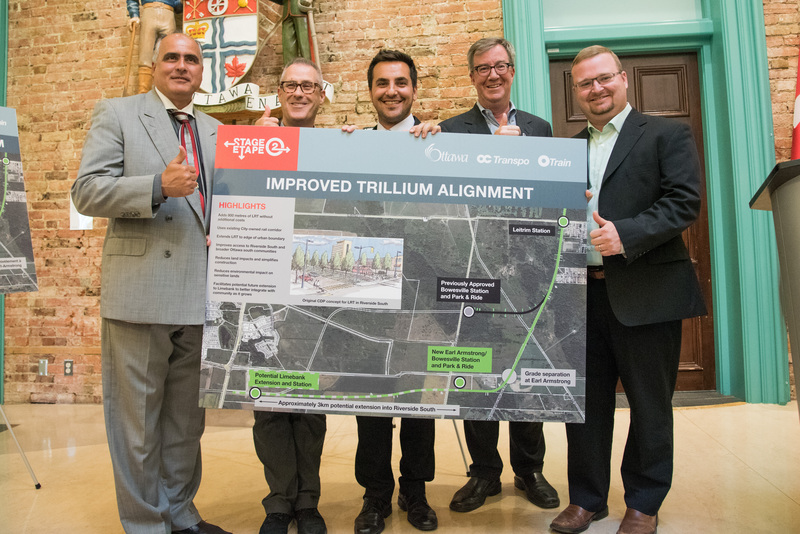 Ottawa – Mayor Jim Watson announced today a new alignment for the O-Train Trillium Line extension as part of the Stage 2 Light Rail Transit project. The new alignment would move Bowesville Station to the edge of the urban boundary just southeast of the Bowesville and Earl Armstrong intersection, bringing rail almost a full kilometre closer to the Riverside South community. The new alignment also takes advantage of an existing City-owned rail corridor, ultimately reducing the environmental impact on sensitive green spaces, in addition to reducing potential land costs and simplifying construction. This new Earl Armstrong/Bowesville station and alignment also facilitates a potential future extension to Limebank Road to better integrate with the community of Riverside South as it grows. This potential future extension to Limebank requires an amendment to the existing Environmental Assessment for the Trillium Line, as well as a targeted update to the Community Design Plan for Riverside South. City staff will be completing these updates over the summer. The Trillium Line extension is one of the three extensions in Ottawa’s Stage 2 project package. In the South, the Trillium Line will be expanded to reach Bowesville Station with a link to the Ottawa Macdonald-Cartier Airport by 2021. In the East, the Confederation Line will extend to Trim Road by 2022. In the West, rail will reach Algonquin College and Moodie Drive by 2023. Once complete, Stage 2 will bring 70 per cent of Ottawa residents within five kilometers of fast, efficient, clean and reliable rail with the capability of carrying an estimated 24,000 riders per hour per direction during peak periods. The complete O-Train system will span 60 kilometres and include 41 stations. Next: Next post: Sky Lounge takes flight!